“El Camarón,” as Rodríguez is known, says when he first emigrated from Mexico he was "pretty sure that I would die." Salvation beckoned on the other side of the river. It was only a couple hundred yards away, but the churning water of the Rio Grande was the fiercest challenge yet in José de Jesús Rodríguez’s short, hard life. Late at night, when he made his forays for freedom, the river was as black as ink. Underfoot were treacherously slippery rocks and other unseen hazards. Growing up in land-locked Irapuato, Mexico, José de Jesús never learned to swim. Now the chilly water lapped against the teenager’s chin, inviting the darkest fear: “If I slip, I die,” he remembers thinking. Day after day, for three agonizing months, José de Jesús tried to steal across the Rio Grande, only to be thwarted by its currents and the United States Border Patrol. So many times he wanted to give up and return home, but what kept him going were the people he’d left behind: seven siblings who slept shoulder-to-shoulder on the dirt floor of their one-room, bathroom-less adobe home; a mother who endured seven stillbirths but still found a way to hand-make tortillas seemingly every day; a father he revered but whose body was breaking under the strain of so many years of toil as a laborer on construction sites. As the second-eldest son, José de Jesús was expected to help provide for the family, which subsisted in part on vegetables grown on their sliver of land. Most nights the kids went to bed aching from hunger. So at age 12 he dropped out of school and began caddying full-time at Club de Golf Santa Margarita, high in the hills of Irapuato. The 20-minute bike ride from José de Jesús’s home transported him to another world. Having spent much of his youth barefoot, he was transfixed by the golfers’ swanky saddle shoes. Luxury cars filled the parking lot, and the air was alive with talk of money to be made in the States. Over time, José de Jesús became consumed with the desire to lift his family out of their meager circumstances. When he was 15, he lit out of Irapuato with only the clothes on his back, a fistful of pesos and the vague promise of America’s opportunity. He had a colorful nickname, too: Camarón (Shrimp), because despite his moreno complexion, his cheeks reddened in the sun. Camarón spent a week hitchhiking and riding buses, journeying more than 500 miles north to the border town of Nuevo Laredo. By day, he panhandled and combed through garbage cans for scraps of food. He slept under bridges and in public parks. Nuevo Laredo was teeming with coyotes promising safe passage across the border for a few hundred dollars, an unimaginable sum for Camarón. So nearly every night, under the cover of darkness, he tried to conquer the Rio Grande on his own. Sometimes he fought his way to the other side only to be nabbed by the Border Patrol. This was back in 1996, when the policy was simply to put such wayward dreamers on a bus home to Mexico. Finally, on Thanksgiving morning, a life-changing scrap of information came his way: the short-staffed Border Patrol had a 2 p.m. shift-change that might open a small window of opportunity. At the appointed time, Camarón plunged into the river. His nerve, and the rocks beneath him, held. On the U.S. side he was greeted only by eerie emptiness. He scrambled up the river bank and sprinted across raw land that looked nothing like the American Dream he had glimpsed on TV. Camarón ran until his lungs were on fire and his feet felt as heavy as anvils. Then he ran some more. Finally, he found a deep ditch by the side of a road and took off his clothes — his only clothes — to let them dry in the sun. He collapsed into the dirt, tears of relief streaking his cheeks. “I thought the hardest part was over,” he says. In fact, it was just beginning. It’s a few days before Christmas 2018, and Camarón strolls the grounds of Club de Golf Santa Margarita, where he is now a dues-paying member. His former colleagues in the caddie yard hail him like a long-lost brother, but the older members also embrace him, onetime caste differences melting away. Camarón, now 37, is wearing natty Italian togs provided by a clothing company that is wooing him, but his weathered face betrays the hard miles he has traveled, while his soft physique is the result of an old-school disdain for the gym. He takes a seat at the outdoor restaurant, not far from a large poster announcing his annual toy drive for local kids; he has already collected enough to consume an entire bedroom in his modern, two-story house not far from the golf club. "El Camarón," as José de Jesús Rodriguez is known, will appear at Torrey Pines this week. His long, arduous path to the Tour is spoken of with reverence by those who have walked alongside Camarón. “He’s a legend,” says Alfredo Ruiz, a regular on the Mexican Tour, where Camarón has won a record 21 times. “It’s the most unbelievable story I know of in golf,” says Andrés Echavarría, a veteran of the PGA Tour Latinoamérica (LAT), where Camarón is the all-time leading money winner, with $299,609 across four full seasons. As part of his annual toy drive, Camaron hands out toys to children in the rural village of La Caja, just outside Irapuato. Camarón spent his first night in the United States sleeping in the ditch by the side of the road. The next morning he wandered into the outskirts of Laredo, Texas. The first thing the 15-year-old saw — naturally — was a Walmart. Nearing the store, he heard a group of workmen speaking Spanish. With nothing to lose, he approached to ask for help. The men had papers, so none of them were eager to take on an outsider who could cause them problems. But Camarón has an easy smile and radiates sweetness. He was so young and disheveled the men took pity on him and shared their lunches. One of the workers told him the crew was about to make the 750-mile drive north to Fayetteville, Ark., to deliver roofing equipment. So Camarón replied, “Then I’m going to Arkansas, too.” Upon arrival, they gave him a little cash for his help moving the machinery, but when Camarón wandered into a phone store to buy a prepaid card to call home, the guys ditched him. As Camarón hung around the phone store, trying to figure out what to do, he saw another customer unintentionally leave behind an item. In the parking lot, he chased after this Hispanic-American gentleman and caught up to him just as he popped open his trunk, revealing a sparkling set of golf clubs. Camarón eyed them with enough interest that the man asked, in Spanish, if he knew anything about the game. They fell into a conversation about golf and the details of Camarón’s life. Every payday, Camarón wired home $200 or $300, keeping just enough for himself to survive. After two years, the family had saved enough money for Rosendo and their father Chuche to pay for safe passage across the border and into Arkansas. They worked alongside each other at Stonebridge Meadow and shared an apartment. Rosendo liked to attend to duties at the range so he could study the players and exchange ideas about the golf swing. Camarón had zero interest in the game. “There wasn’t time for it,” he says. “I was working six or seven days a week, from 6 a.m. to 7 p.m. I would get home, shower, eat dinner and prepare my food for the next day. Then it was time to go to sleep.” If he had any free time he played soccer in a high-level league that included members of the University of Arkansas team. Camarón says that during his decade in the U.S., he didn’t play one full round of golf. In 2004, Stonebridge Meadow underwent a change in management, and the Rodriguezes were suddenly out of work. Rosendo and Chuche returned to Mexico, but Camarón stayed in the States for two more years. He did a long stretch as an itinerant field worker, harvesting wheat, corn and strawberries. He also spent a year working at Territory Golf & Country Club in Duncan, Okla. Finally, in early 2006, it was time to go home. Camarón had left Irapuato as a boy and now was returning as a man of 25. His family was still living on the same plot of land, but it had been utterly transformed, largely by the money he sent home: the one-room shanty had been torn down and replaced by a pair of sturdy, two-story homes, with full kitchens and a blessed number of bathrooms. The trajectory of his siblings was also altered, none more so than his younger brother Dany. Rather than have to drop out of school to work, Dany became a standout student who would go on to earn a law degree. When discussing his self-imposed exile, Camarón is matter-of-fact. He had a duty to help his family, and so he did. Mexican golf star José de Jesús Rodriguez stands with his mother, Josefina Martinez Aguilar, in front the Virgin de Guadalupe shrine at her home. His mother is extremely important to Rodriguez. He expresses gratitude to her for everything he has become and frequently talks about how deeply he missed her when he lived as an immigrant for years in the United States, before becoming a golf star. Alfonso Vallejo Esquivel is a success story of modern Mexico — he made a small fortune in pharmaceuticals and retired to a nice life playing golf every day at Santa Margarita. But when he’d pull up in his shiny Cadillac, the caddies would scatter, for Vallejo was known as a parsimonious tipper. Once again, the golf gods played matchmaker for Camarón. Not long after returning to Irapuato and the caddie yard, his lack of seniority forced him to take Vallejo’s bag for an early-morning round. Afterward, Vallejo told Camarón he was impressed by two things: his sophisticated understanding of course management, and that he was the only caddie who’d never bitched about not getting a tip. He asked Camarón to be at the club at 6 a.m. the next morning for his usual dew-sweeping round, but with a catch: If Camarón was punctual, Vallejo promised to double his usual wage; if Camarón straggled in late he would have to work for free. This seemed a safe bet for Vallejo. Down the hill from the club is a cantina where the Santa Margarita caddies gather. “There were many talented players among the caddies, but they wasted their life at the bar,” Camarón remembers. “I wasn’t going to be one of them.” He was waiting on the 1st tee for Vallejo on that fateful morning, and every one that followed. Rodriguez (R) his wife, Blanca Nieves Gonzalez, their son, José de Jesús Rodriguez, 10, and their daughter, Ximena Rodriguez, 12, ouside their home, located in Irapuato, in Mexico’s Guanajuato state. At Q School, he earned status for the 2007 season. He played just well enough for Vallejo to keep sponsoring him, and the following year Camarón won his first tournament, in Puebla, at the age of 27. His long journey through golf’s minor leagues had begun. In 2010, Camarón won four times in Mexico. With winner’s checks ranging from $10,000 to $15,000, he could have stayed on his home tour and provided a comfortable life for Bianca, daughter Ximena and José de Jesus, Jr. But now something had been stirred deep within Camarón. Once again he left his family and headed north, chasing opportunity. In 2011, he won twice on the Canadian tour and topped the Order of Merit, with $80,277. (At that year’s World Cup, he was so star-struck he asked Rory McIlroy for an autograph.) Camarón kept moving up the ladder, and in 2013 he won twice on the LAT to finish second on the Order of Merit. Camarón credits Vallejo for this trait: “I could play without fear because he took such good care of me.” Indeed, Vallejo paid all of Camarón’s travel expenses across North and South America but asked for nothing in return. So Camarón devoted himself to paying forward the kindness. At a long-ago tournament, Echavarría witnessed Camarón befriend a young busboy at a restaurant and, hearing of the kid’s family’s struggles, he made him his caddie for the week and paid him lavishly. “I promise you, everywhere this tour has gone there are stories like that,” Echavarría says. Camarón’s banner season on the LAT earned him a promotion to the Web.com tour for 2014. In 18 starts he had a pair of top-10 finishes but also 10 missed cuts, struggling mightily on the fast greens. “This is why,” Camarón said recently, tapping his putter on the slow, shaggy, bumpy practice green at Santa Margarita. Mexican golf star José de Jesús Rodriguez (R) practices on the driving range at the Club de Golf Santa Margarita, located in Irapuato, Mexico, while being observed by his brother, Rosendo Rodriguez Martinez, 42, a golf coach (L). Rodriguez lived near the club as a child and began working there as a caddy, before his exceptional life trajectory transformed him into the golf legend he is now. note: young boy in background is Marcelo León Batta, 8, who appears in other photos. Finishing 82nd on the Web.com money list was a small setback in an otherwise upwardly mobile career, but tragedy struck in December 2014, when Vallejo was murdered in Irapuato under hazy circumstances. (Says Mayra, “The police suggested an attempted robbery but nothing was stolen.”) Camarón was devastated and felt lost throughout the ensuing season, suddenly worrying about money and what his future held. His funk deepened when his father died of natural causes in early 2016. After another winless year, Camarón says he seriously considered quitting the game. But accessing the same grit that carried him through the unimaginable hardships of his youth, he rededicated himself for the 2017 season with a blistering practice routine. “I decided I wouldn’t play for myself, I would play for them,” he says of his father and of Vallejo, his guardian angel. In ’17, Camarón won two more times on the LAT, scrapping his way back to the Web.com for the following season. He tied for third at the first event of the 2018 season and followed that with three more top-25 finishes. Along the way he earned a measure of Internet fame for the way he audibly sweet-talks his ball. “I have to be nice — the whole family is counting on her!” he says. In April, Camarón brawled with one of the toughest tracks on tour, Victoria National Golf Club, in Indiana, to earn a spot in Sunday’s final pairing at the United Leasing & Financing Championship. He was playing alongside Maverick McNealy, and so the storyline was inescapable: a 23-year-old hotshot from Stanford and son of a billionaire vs. El Camarón. But tournament golf is the ultimate meritocracy, and the pride of Irapuato won the event and his playing partner’s enduring respect. In victory, an emotional Camarón pointed at the sky. Twenty-two years after he had defeated the Rio Grande, another improbable journey was complete, as the PGA Tour was now within his grasp. On the morning of Dec. 21, Camarón saunters into the caddie yard at Santa Margarita in his usual good cheer. “I am always smiling,” he says. “It is a gift from God.” He points to one looper and teases, “He’s the most drunk,” then points at another and announces, “No, he is!” But there is a heavy feeling in the air. In low voices, Camarón is informed that, the night before, one of the regulars at the cantina where the caddies gather had been tortured and killed by sicarios. Violent crime in Irapuato — which is midway between Mexico City and Guadalajara — has surged over the last two years as the Jalisco cartel has moved into the area. This most recent murder hits close to home for Camarón, because the dead man was an old friend who lived down the street from the homestead where his mom and siblings still reside. Camarón leaves Santa Margarita to go check on them, and a number of hard-looking men are loitering on the road that leads to his mother’s house. Camarón personally escorts his visiting journalists into the neighborhood, saying it is necessary to ensure their safety. Once the gate closes at the family home, the tension disappears. Camarón’s sisters pours lemonade for the guests while his mother, Yoye, sits in the shade telling stories. 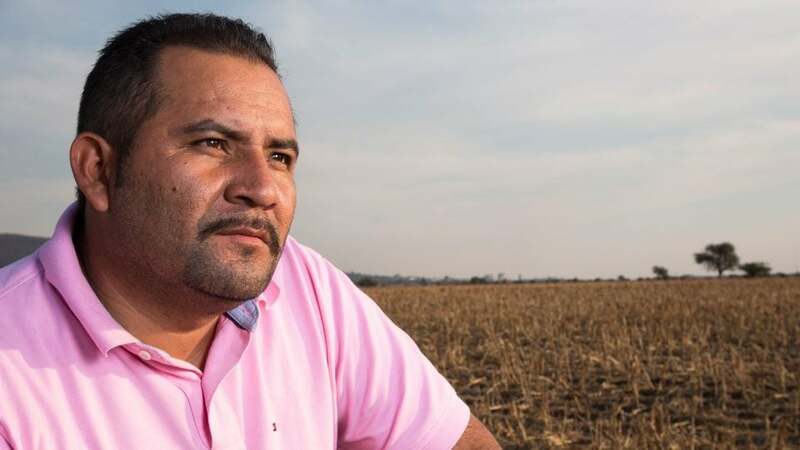 At his mother’s home in Irapuato, Guanajuato, Mexico, Mexican golf star José de Jesús Rodriguez stands in front of the now empty plot of land where his one room childhood home once stood. Navigating the threat of cartel violence is not the usual concern of a PGA Tour member, but Camarón has become used to the dissonance of traveling between two dramatically different worlds. When the unknown rookie turned up to register at Tour events last fall, he kept getting the same reaction: “They always point [me] toward the kitchen,” he says with a laugh. His visa prohibits him from establishing residency in the U.S., so he travels in and out of the airport in Guanajuato, Mexico, and every time he lands in America “they take me into a little room and ask me many questions,” he says. Camarón lives modestly, driving a small Hyundai SUV. The cartel’s bad hombres roar around in Escalades with shiny rims. 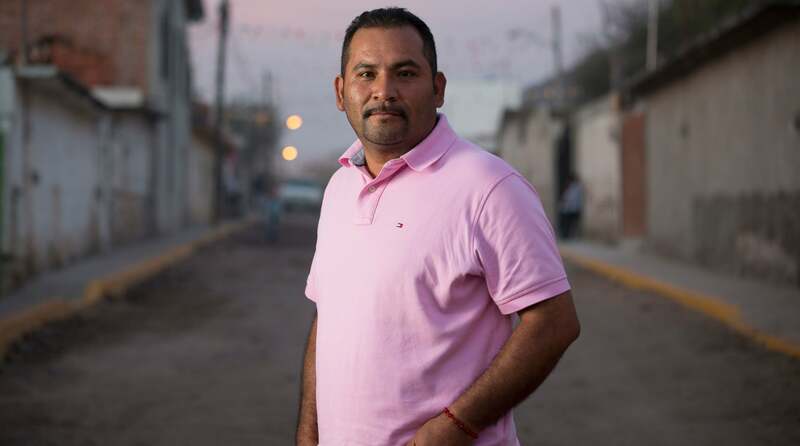 He says he does not worry about his safety in Irapuato because “I came from the streets.” That is, he grew up with many of the men who have now gone to the dark side. Even so, he has applied for a different visa, one that would allow him to live at least part-time in the U.S. A quiet street in Austin, Texas, is the dream (though his daughter, Ximena, says she would prefer Beverly Hills). “I would like a different life for my children,” Camarón says. It is a given that they will go to college. Twelve-year-old Ximena, bright and charismatic, says she wants to be a petro-engineer, while Jose de Jesús, Jr., a charming 10-year-old goofball with his father’s love for fútbol, is intrigued by computer science. Ximena speaks good English and is trying to tutor her father, as is Mike Dwyer, Camarón’s American caddie, who knows no Spanish. Between the ropes, there are other adjustments to be made. At 5 feet 9 inches, 175 lbs., Camarón looks a bit like Francesco Molinari standing over the ball, and his strike with the irons is nearly as pure. But he is still struggling with the glassy greens on Tour, and his driving distance of 297.3 ranked only 114th on the bombs-away Web.com. He is now finding that missing fairways on the PGA Tour extracts a higher toll. More than anything else, the mental game is a battle. When Camarón makes a couple of bogeys, he sometimes frets about keeping his playing status or how he will cover his expenses without Vallejo to take care of him. Last November, at the Mayakoba Golf Classic, Camarón earned a third-round pairing alongside Rickie Fowler. He felt he outplayed him tee to green, but Fowler shot a 69 to trump his playing partner by three strokes. Camarón studied him carefully throughout the round. “He was so calm,” he says, wistfully. Recently, Camarón has begun working with a sports psychologist to learn to quiet his mind. But there is an inescapable burden in knowing that you are playing for something larger than yourself. Illegal immigration has become the most divisive political issue in the country where Camarón now plies his trade, and he says, “I want to set a good example so American golf fans can see we are good people who want to work hard.” In the last year, he has been contacted by a number of blue-collar strivers he labored alongside during his previous stint in the U.S.
"I’m never going to stop fighting,” Camaron says.